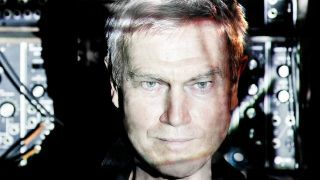 PRODUCTION EXPO 2014: Founder of British new wave band Ultravox, John Foxx rode the electro pop bandwagon with much acclaim for his classic 1980 album 'Metamatic'. This was followed by romanticised musings on a series of under-appreciated acoustic/electronic releases throughout the eighties. Today, Foxx is busier than ever. Having made notable recordings with Benge and Harold Budd, his latest union with Steve D'Agostino marks a stunning return to form on the album Evidence of Time Travel, motivating us to politely request that Foxx compare and contrast the two eras. "High-end, expensive gear is impotent until it gets cheap enough to fall into the hands of the instinctive, untrained, feral bandit"
Are imagery and the use of video as important today as they were in the 80s? "In the 70s I seem to remember Marc Bolan being asked how much of his success was due to image and how much was down to music. He replied 'about 80% image'. Of course, proportions vary, but in his case I think that was about right. "All artists - of every kind - need a proper story to set their work in context and connect it to the rest of the world. That's the audience gateway. The story needs to be as true as possible to really connect. Imagine Van Gough without the ear being cut off and no Starry Night - he wouldn't be anywhere near as popular." Where does that desire to create an image derive from? "Artists invent stories according to what media is available to them. It's their job. Modern music characters are actually evolved versions of Music Hall characters. You wear interesting clothes and do something odd to attract attention; then you sing a song to illustrate the world of the character you invented. "Everyone from Ziggy to Johnny Rotten to Burial does this - consciously or not. Usually, it's gloriously and laughably instinctive - at first. Then, if you survive the first few years, you might begin to glimpse a little of what you're actually doing to yourself and everyone else." Has that aspect evolved at all? How do you see it operating in modern music? "The most recent strategy seems to be 'Anonymous Man of Mystery' - Banksy, Aphex Twin, Burial, The Knife etc. It's a good one - mainly propagated by Banksy, who certainly wouldn't have achieved what he has without the invisibility cloak. It's a great inverse use of ubiquitous media; the opposite of the weary celeb 'expose everything' riff, but using identical means." How has the affordability of gear altered how you operate over the years? "I always hold to the principle that cheap gear is what alters things. High-end, expensive gear is impotent until it gets cheap enough to fall into the hands of the instinctive, untrained, feral bandit. Cheap guitars made the sixties possible. Cheap synths made Detroit Techno and Acid House possible. "Now you've got cheap digital and cheap retro analogue, plus video, app writing, instantaneous worldwide networks and territory, and income-grabbing opportunists like Apple and various Cloud formations etc. interposing themselves. Things are sure changing form." How has the writing process change for you? "It hasn't changed one jot. All I ever need is a strange sound that makes some emotional connection and I'm away. A song will occur." Has sequencing/sampling changed much since its mid-eighties conception? "I've never done much sampling; it always felt like a wrong turn to me. Sequencing can be a good start, but I always like someone else to set it up, or I lose the song to mathematics and connectors. The song is the thing." "Since the advent of Apple and MP3, an era has ended - as sure as the demise of Hollywood, Music Hall or any other 'Golden Era'"
The hardware vs. software/analogue vs. digital debate rages on. Where do you stand? "They all have their own inherent qualities. Limiting your palette is an essential discipline, no matter what road you choose. Analogue vs digital is all fashion, I'm afraid. It was deeply satisfying to discover Benge's generation - who realised that analogue had been discarded too early for digital, and there was still a massive amount to explore there. Out of the skip and into the studio was Benge's motto. He rescued an entire sonic universe. Truth is you need both - digital to stabilise content and analogue to provide it." Outboard vs. mixing in the box? "Depends what sort of sound/song you want. I don't have a preference for either, they both have their own advantages and disadvantages and inherent qualities. My advice is, use where appropriate." How has the industry changed? Do you feel it's for the better or worse? "It has totally changed. Apple has made a vast land-grab without so much as a whimper from the electorate - so that's it for this generation. Before you were dealing with the whims of record companies, but there was enough money in the system to support the marginal - who were always the most promising. "There was a massive infrastructure, all geared towards making this wild stuff financially viable - even wildly lucrative. That's all gone. Then Simon Cowell slipped into the pilot's seat like a rat up a drainpipe." "Since the advent of Apple and MP3, an era has ended - as sure as the demise of Hollywood, Music Hall or any other 'Golden Era'. The entire form, motivation, distribution and promotional and financial infrastructure have been rapidly dispersed. It's unlikely you'll become rich anymore, so it's back to a marginal folk art. Maybe that's a good thing. We'll see. As for me, I'm firmly post-digital now." Are you playing live much these days? Has the technology made it easier? "Yes, it's easier - unless you choose to carry analogue gear, in which case it sounds wonderful but is genetically inclined to destroy humans." "I'm rehearsing with Karborn and Steve D'Agostino for the BFI screening of 'Evidence of Time Travel'. I'm also recording some deliciously slow, domestic piano music and working on a peculiar album called 'Electricity and Ghosts'. In terms of collaborations, I'm currently conversing with Rob Simon, Clint Mansell, Macoto Tezka, and Soft Moon."